The Import/Export feature allows users to export library content into an Excel or CSV file (Problems, Tasks, How-Tos, Amendments and Glossary Terms). Files can be edited and reimported to update corresponding Library content in the system. In addition, a full library can be downloaded as an export-only ZIP file. You cannot delete library content items through a library import. You can create new items and change existing items when appropriate, but you can never delete existing items. The user has the permission Global role→Customization→Customize content. Select the Export file_download icon. The downloaded ZIP file contains low-level details about content (amendments, how-to’s, problems, survey, and tasks) including match conditions. Under Templates, select the Empty option. Under Templates, select the All Data option. Only export the content of Tasks, Problems, or Glossary items. Library→Glossary to export Glossary items. 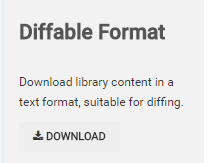 The library content you select is then exported in the format of your choosing. The file template content you select is then exported in the format of your choosing. Submit bulk changes to the content library using the import function. Up to 5 files are supported in a single import. Click Choose File and select the .xlsx or .csv file containing your changes. If you have up to 5 files, click on Choose File and select each one. Review the changes detected by the system. New content will be displayed in green, and any old content (that will be overwritten) is displayed in red. Only new or updated rows will be displayed. Apply the changes by clicking Accept. Otherwise, click Cancel to abandon the import. Review the changes carefully. You cannot reverse an import once you apply it. Make any required changes to the file. Restart the import process with the updated file.